NLDS Game 2 Preview: Syndergaard vs. Greinke | We Gotta Believe! The Mets take on the Dodgers in game 2 of the National League Division Series. 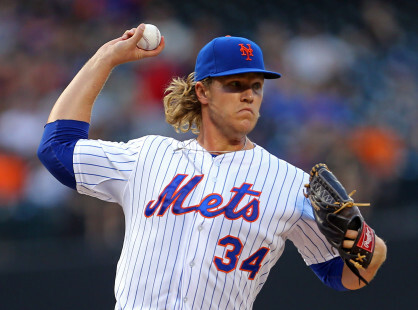 Noah Syndergaard (3.24 ERA, 3.25 FIP, 1.05 WHIP, 150 IP over 24 starts) faces off against Zack Greinke (1.66 ERA, 2.76 FIP, 0.84 WHIP, 222 2/3 IP over 32 starts). The Mets currently hold a 1-0 series lead after their 3-1 victory last night. In 14 innings over 2 starts against the Mets, Zack Greinke has held the Mets to only 2 runs, while Noah Syndergaard held the Dodgers to only a solo home run in his 6 innings against them (to Adrian Gonzalez).